Ideal for an Omega necklace, a nice chain, or enjoy as a lapel pin and pendant combo. Already captureing the beauty of the Saddlebred, we wanted to take it to another level. This piece offers great two dimensional design and extreme Saddlebred features that would bring happiness to any Saddlebred lover. Available in 14kt yellow gold, 14kt white gold. 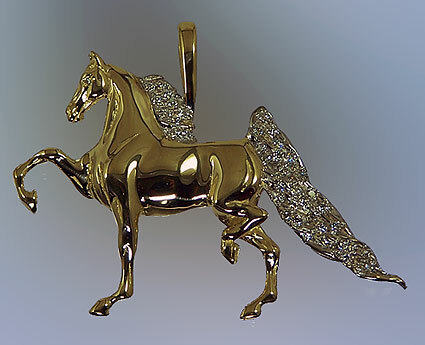 Offering .46ct of diamonds set in the tail and mane.